South West Specialist Cleaning Ltd, based in Beaminster, Dorset offer a comprehensive range of cleaning services to suit the majority of commercial needs. No matter whether you have commercial, retail or industrial premises, presenting a clean business environment is vital to impress clients and customers as well as improving the morale amongst your employees. South West Specialist Cleaning Ltd are totally committed to maintaining and protecting your corporate image by delivering the highest standard of professional cleaning. From daily cleaning to periodic visits and through to facility management, we provide a comprehensive range of cleaning services to suit the majority of business needs and even the strictest of hygiene standards. We are registered waste carriers too. We cater for the needs of a wide range of industries and businesses throughout West Dorset (Bridport, Beaminster, Lyme Regis, Dorchester, Weymouth, Portland), East Somerset ([Crewkerne, Yeovil, Chard), East Devon([Seaton, Axminster, Honiton). 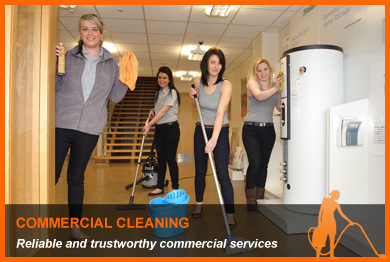 With a fully insured, fully trained team of cleaners there is no job too big for South West Specialist Cleaning Ltd. If your office or workplace requires the highest standard of cleanliness then South West Specialist Cleaning Ltd are the best choice for you. This fully insured, professional, family run business works to the highest possible standards letting you relax safe in the knowledge that your place of work will always have a professional, fresh sparkle!